If your business defines itself by offering variety of artistic products or services then Mosaic Business cards may be the right choice for you. Business owners such as photographers, artists or hair stylists can use the Mosaic business cards as a way to showcase their work and work double-duty as a mini portfolio. So how does this work? Silkcards can print a mix of different designs and photographs on one side of your card (the other side of the card must be static). This allows you to print using differents images/photos on each card and order in smaller quantities. Why order a set of 500 of the same card when 50 cards will suffice to help promote your business and add a distinct personal element. Mosaic Business are printed on sturdy 14 pt stock and are tear- and water-resistant and are silk laminated on both sides for a silky smooth feel. 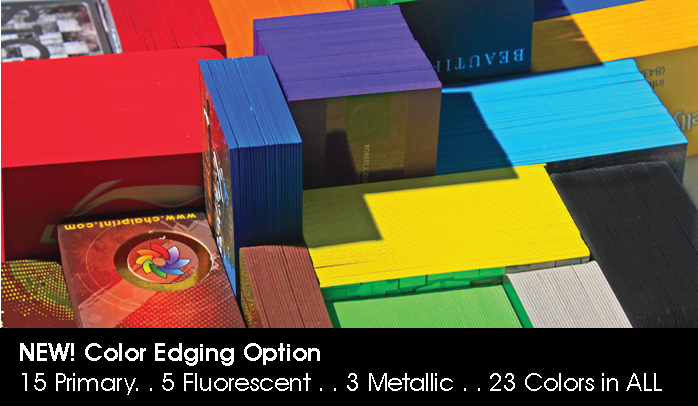 Add some unique elements to your card by customizing with available options such as: Spot UV (on all cards), colored edges, rounded corners and die-cutting. Send us your artwork or, work with one of our graphic designers to help bring your branding to the next level.